Newspapers have flashed around headings such as ‘Scientists Planning to Make New Form of Life.’1 But how are they doing this, what are the ethics behind it, and does it disprove Creation? The idea is to create a partially man-made single-celled organism which is as simple as possible. The major players are J. Craig Venter and Nobel laureate Hamilton O. Smith, famous for founding Celera Genomics Corp. that deciphered the human genome (see Genome Mania—Deciphering the human genome: what does it mean?). They plan to start with the simplest known self-reproducing organism, Mycoplasma genitalium. Actually, even this is still extremely complex, with 482 protein-coding genes, a total of 580,000 ‘letters’.2 By comparison, humans have 3 billion letters including an estimated 30,000 to 50,000 genes. Mycoplasma’s immense complexity means we are far from really understanding how even this simplest life-form functions. So their next step is to try to understand, with the help of a powerful computer, ‘every conceivable aspect of the biology of one organism, a feat science has never come close to accomplishing’.1 From this, they will try to work out the bare minimum number of genes required for survival. Then they will generate DNA with the right sequence of ‘letters’ for this minimum complement of genes and inject it into a hollowed-out Mycoplasma. They hope that this will result in a semi-artificial cell that will be able to feed and reproduce, and generate a population of new life forms. Note that they are still miles away from creating life—this is still very theoretical. Venter convened a panel of ethicists and religious leaders to discuss whether it was right to try to make a new life form. But debates about morality are futile unless there is an authoritative source for morality. If we are simply rearranged pond scum as evolution teaches, then morality is just an illusion-just particular motions of electrons in our brain which gave our alleged ape-like ancestors a survival advantage. Conversely, if we have been created, then our Creator owns us and has the right to make the rules for us. Therefore it is logical to begin with the Creator’s moral handbook, the Bible, which is also His revelation of the true history of the world. Even where there is no direct teaching, there are principles that we can apply. But sadly, even many Christian ethicists refuse to bring in the Bible in discussions about morality. This should not be surprising when they have long rejected the Bible’s true history found in Genesis. Any outworking of this dominion mandate must be for good, not evil. Knowledge in itself is not evil (2 Corinthians 8:7, Titus 1:15). This present creation is cursed because of man’s sin (Genesis 3:17–19, Romans 8:20–22 —see also Q&A: Genesis: Curse). So we should not underestimate the potential for evil uses, or man’s conceit in thinking he knows more than he does and messing around without proper understanding. But we should also support advances which help alleviate the effects of the Curse, e.g. new cures of diseases. There are certain ‘hot potatoes’ which are ‘wisdom’ issues. I.e. the above principles are not negotiable, but the application of these principles requires seeking out the best true science applying to the issues, and praying for wisdom from God in prayer (James 1:5, Col. 1:9). There seems to be nothing wrong in itself with creating new non-human life forms, and the advance in knowledge for its own sake would be worthwhile. This knowledge may have some practical uses. Venter and Smith plan to add new functions to it one at a time, e.g. to break down excess carbon dioxide or to produce hydrogen for fuel. We must be cautious of possible dangers. Mycoplasma genitalium is a parasite that causes some types of urethritis. Other types of Mycoplasma cause pneumonia. But the researchers plan to delete the gene that enables Mycoplasma to stick to human cells. They also have good reason to believe that the organism will be too fragile to be dangerous (see next section). But even with these precautions, it’s essential to be especially cautious, especially with the possibility of terrorists using biological warfare. Would creation of life disprove Creation? The most obvious response to this is that the scientists have not actually produced these new life forms, just planned to. Most importantly though, CMI has never actually claimed that man can’t create life. Rather, we claim that intelligence is required to generate life, and specifically the literally encyclopedic quantities of information on which life depends. 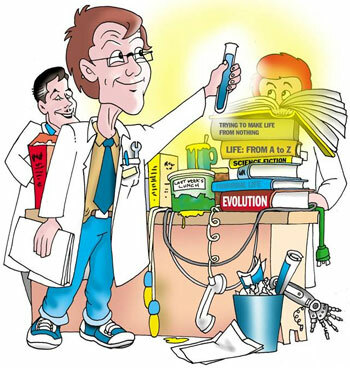 So, as illustrated by the cartoon on the right, if Venter and Smith succeed, it would actually reinforce our claim! They rely on meticulous planning, not just throwing a few ‘building blocks’ into something resembling the hypothetical primordial soup. This correspondent is far from the only antitheist who has missed this obvious point—the atheistic anti-creationist Ian Plimer also made this blooper (see More nonsense from Professor Plimer). This illustrates the futile thinking that always results from a wilful rejection of the plain evidence of God from creation (Romans 1:18–23). As mentioned, Mycoplasma, although still extremely complex, is a parasite. This is most likely the result of a loss of genetic information, e.g. for amino acid synthesis, resulting in the mycoplasmas’ becoming increasingly dependent on their hosts for survival (see Genome decay in the Mycoplasmas, by the geneticist Dr Todd Wood). This means that Mycoplasma is not a possible candidate for the first living cell, because it can’t survive without more complex cells. 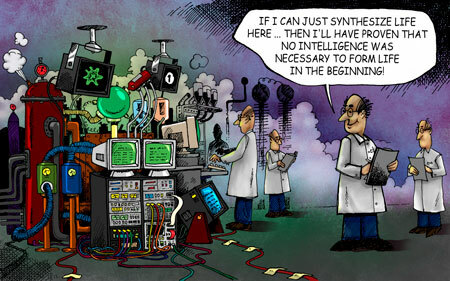 It indicates that the first living cell in chemical evolutionary theory would need to be even more complex. Therefore a cell even simpler than Mycoplasma, such as the one planned, is even less likely to be able to survive in a primitive soup. Actually, Venter and Smith are not the only ones to try to work out the simplest possible cell. In 1997, Eugene Koonin and colleagues came up with an estimate of 256 genes as a minimum requirement for life. But they were doubtful whether such a hypothetical bug could survive, because such an organism could barely repair DNA damage, could no longer fine-tune the ability of its remaining genes, would lack the ability to digest complex compounds, and would need a comprehensive supply of organic nutrients in its environment. See How Simple Can Life Be?. While this is an interesting research project, it is still in its infancy. There is nothing morally wrong with trying to create new life forms, but exceptional caution is wise. Finally, far from supporting chemical evolution, it reinforces the creationist claim that intelligence is required to create new life! Gillis, J., Washington Post, 21 November 2002, Page A01. Fraser, C.M. et al., ‘The minimal gene complement of Mycoplasma genitalium’, Science, 270(5235):397–403, 1995; perspective by Goffeau, A., ‘Life with 482 Genes’, same issue, pp. 445–446. Other reports have a different number, but all within the same ball park.